Give Me The 1st Dance. Standard sparkly silver foil. Not unique, but not a bad color. My Lifesaver. Wow. This one was not in the promo pictures I originally saw of this collection, so it was a complete surprise. It's awesome. It's not as sky blue as it looks here, it's actually a turquoise creme. The shade is somewhere between MAC Peppermint Patti and China Glaze For Audrey, closer to the Peppermint Patti side. Super creamy finish, easy, non-streaky application, very pigmented. All around great shade. OMB! Another pleasant surprise. Very different from the promo pics. This is an amazing fiery, duochromey glass fleck red. My pictures don't do it justice. The main duochrome colors are orange and pink, weird contrast between cool and warm in this polish. See this one in real life if you get a chance. Me + Blue. A blue shimmer base absolutely packed with holographic microglitter. There's just a ton of glitter in this. It's not your traditional holo that's made from little flat sheet-like particles. This is like some of the Nubar Gems that are a shimmer base color with chunky holo glitter, but so much of it that it looks like a true holo under sunlight. It is a little lumpy, but because there's so much glitter you almost don't notice. One Less Lonely Glitter. What a name. Great color, though! Light lavender glitter in a clear base. It has tiny little glitter particles mixed with bigger round pieces. Very sparkly. Delicate. Nice opacity, too. Prized Possession Purple. A medium purple shimmer. Very pretty color, but the formula was quite unruly. It was very watery and the brush was defective so I found it rather frustrating to apply. I wish I had something better to say about the formula because the color is so nice, but it reminded me of trying to apply NYX Wild. Step To The Beat Of My ♥. 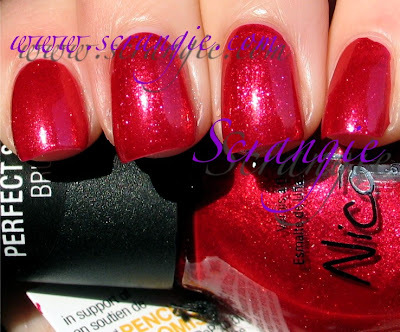 One of Nicole's signature heart polishes. This one is tiny opal glitter in a very faintly purple tinted base and it has purple and red holo metallic hearts. This is meant for layering but if you like a more subtle look you can wear it alone. Overall, the colors are quite nice. I love My Lifesaver, One Less Lonely Glitter and OMB! the most. They're nothing at all like the promo pictures would have lead me to believe, but they're still very pretty. Some of the shades can be easily duplicated, but I'm sure Bieber fans would love to have these either way. There's some info cards attached to these bottles and they say, "In support of Pencils of Promise. Join Justin and PoP to build 100 schools around the world." It doesn't specify that any proceeds go to Pencils of Promise or anything about a charitable contribution or anything like that... So I'm unclear on whether or not any money from these goes to support a cause, but I'll see what I can find out. These are available now at Wal-Mart. My Lifesaver is beautiful... looks like I'll be fighting through the hordes at my local Wal-mart sometime this week! Thanks for the swatches! What I find interesting is that, given Bieber's target audience/fanbase, they're expecting preteen girls, little 14, 15 year old girls, to drop $6-$8 on a single bottle of polish. Maybe it's just me, but I couldn't justify that at 15, and I had a weekend job that was getting me a decent chunk of pocket change. When I first heard that Nicole by OPI teamed up with Justin Bieber, I thought it was hilarious! The colours are okay, but looks like I'll be passing on this collection because nothing moves me. just a way for nicole by opi.. to sucker in the thousands of younger beiber fans.. little girls love bieber and love nail polish.. my two beiber fan younger cousins.. know nothing about nail polish but knew about this.. they definately know what they are doing . lol even if its confusing for us! OMB looks gorgeous definately one ill be picking up! Pretty, but nothing I really want. I am wearing My Lifesaver today! Its actually very close to Essie's Turquoise & Caicos. WOW!!! How come your nails are so pretty and white, even with all that dark polish you're wearing?! :o 'Fess up, what's your secret? :D And don't give me the base-coat crap, because I wear a base-coat all the time and my nails are still stained. I've heard that Wal-Mart is reporting the collection as sold out in all of their stores. Wow, I love the look of Black Shatter over Me + Blue! And now I feel like I need One Less Lonely Glitter...it's so pretty!! I just need to get past those darn Nicole bottles! I have OMB!, One Less Lonely Glitter, and Step To The Beat Of My ♥ and I like them all! Did you hear that they're doing another Beiber collection for Spring 2011, too? I love ML, M+B and OMB. PPP I'm not sure about. Overall, surprisingly good collection. Maybe I'll find these at my Wal-Mart! This is a neat collection. I like half of these! The collection was done to raise money for a foundation that builds schools around the world called POP, which Justin Bieber either founded or is just a spokesperson for. I don't want to want these polishes but I can't help it. I really want My Lifesaver and One Less Lonely Glitter but I a) hate Walmart b) am not a Bieber fan c) hate those ugly Nicole bottles and d) don't want to pay that much for a polish when I'm used to paying transdesign prices. I can't wait to get the shatter! Pretty. OMG! These polishes are going on ebay for $35 A PIECE. Bieber fever is real. Not going out of my way to get these. These are nice enough but nothing really special. I like the crackle nail. I probably won't get any, but I do like the colours! I went to a Bieber concert (NO SHAME) and for each ticket sold, $1 was donated to Pencils of Promise. I wouldn't be surprised if that was the case here. Fuwari, lol! My nails are usually somewhat stained, it really does depend at least a bit on what basecoat you use. I notice more staining with some more than others. I don't really have a secret, I don't do anything to try to whiten them anymore cause I wear polish 24/7! Tracie, OMB!! lol. I can not believe that, that's insane! Krissy and Jess, thanks for the info! I just wanted to say that I found the Beiber on clearance at Walmart last night for $6 Just an FYI, I had a hard time finding it, only to see it there. My Lifesaver and Me + Blue are heartbreakingly gorgeous, but I just can't do it! 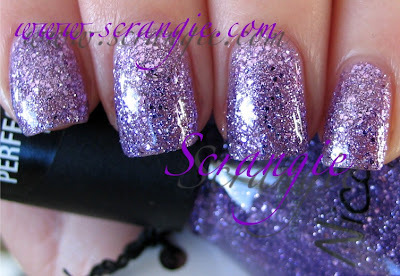 Is One less lonely glitter a dupe for Color Club Tru Passion?